I am sure this has been asked somewhere but is there a list of motors that are equivalent to the one in the power pack c? The naming convention on these motors are inconsistent. I am currently building the x29 and it recommends a park 425 equivalent, 1200 kv using a 4s 2200mah battery. I ordered a motor and then realized it may not be the right size (see picture). I did some more research and found a suppo 2217/7 1250kv motor, which sounds like it might be the right size but it only recommends a 3s battery? Would this motor work for the X29? 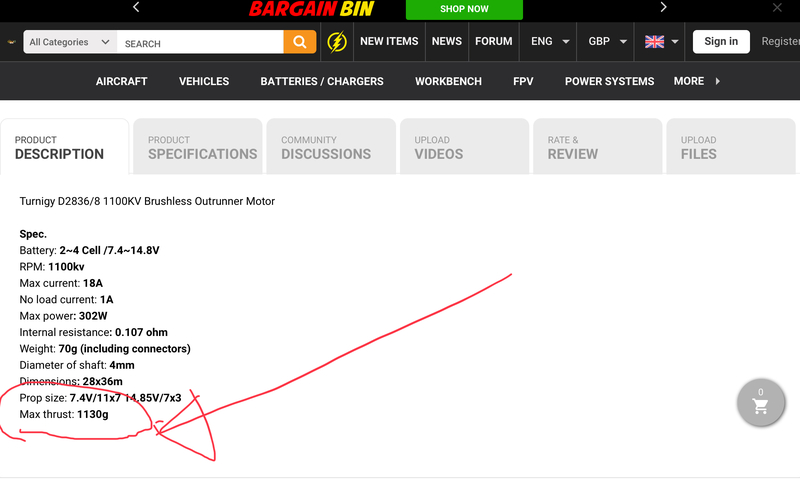 The x29 recommends a park 425/1200kv motor. This question has been asked before. Search turned up this thread which indicated that was purely a can size, a small outrunner of comparable thrust like this one would seem to fit the bill. Might also be worth contacting customer support at FT as the Park 425 has gone from most places and they should change the listing. The one included in power pack C is a 2215/10 1100KV which isn’t hard to find on its own, you want to check direction if it’s a pusher, make sure you get a pusher prop. I am sure if the motor you found says 3s then you would be better off with that and maybe a steeper prop pitch, or get a higher KV to compensate for the lower voltage. @FDS hey thanks I really appreciate your help! I did some more searching on the forums and found this one https://hobbyking.com/en_us/turnigy-d2836-8-1100kv-brushless-outrunner-motor.html . The turnigy 450 says it is for a 3s as well. Out of curiousity, cant a CW prop be used and turned around as a pusher? Do pusher props have a different shape to them? Thanks again for your help. Not built a pusher, I understood that you are always better buying a dedicated pusher prop but there’s probably ways round that! 2836 is a bigger overall size, watch out for the motor weight. You want to keep as close as you can to the one sold in the C pack or you will find it harder to CG. I would stay with 3s whatever you do as the pack can be lighter with a similar capacity thus giving good flight duration and keeping the weight down. You are looking to match the thrust of the recommended set up, not the voltage. Motor weight is exactly the same at 70g. Aren't voltage and thrust directly correlated? Wouldnt a 4s would give more thrust? The overall power of a motor tends to be indicated by Watts. This is Voltage x Amps. Yes, but the motor KV is designed to work in a certain voltage band, with a range of prop pitch to suit. If you spin a fixed pitch faster it doesn’t give a linear increase in thrust, you add motor load and at a certain point you lose thrust vs a lower voltage thus lower RPM with the same prop. You can go more volts with a smaller prop but if the motor spec recommends 3s you will make it run hot and potentially damage it on 4s. A higher voltage pack does not increase current, the motor draws the current it needs to meet the load applied up to its peak or the peak possible from the battery/esc. That ignores the added weight of a 4s battery vs the same capacity 3s motor, since a 4s carries an extra cell. The C pack does not recommend a 4s pack. If you run a 10x4 prop on an 1100kv at 4s you will certainly be out of its optimum rpm band, you would need a smaller lower pitch prop. You are making your life complicated, look at the all up weight of the kit you are making, add the weight of your battery and electronics, then take the motor spec you want to buy and put it into the thrust per lb calculator then you can see what sort of flight characteristics you will get. I appreciate all the help. 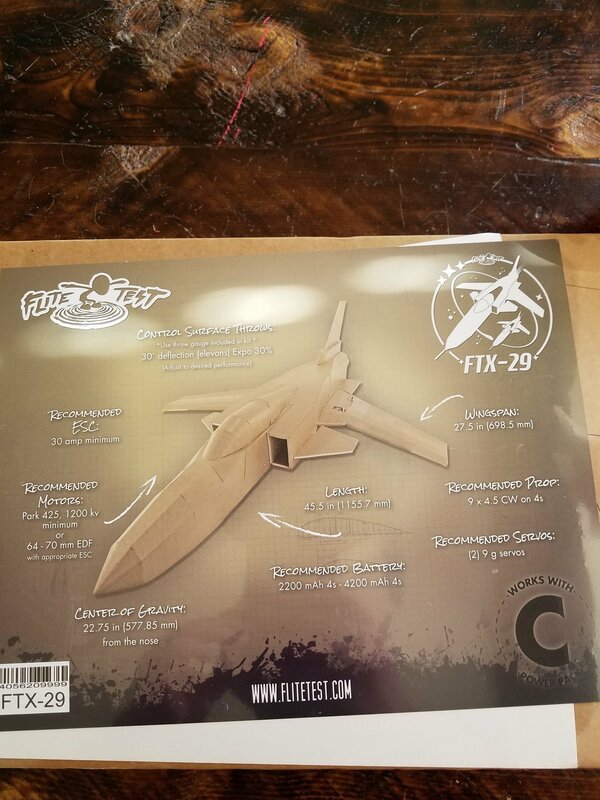 I am over thinking this because I attempted to scratch build the F-22. I tried several different motors and props on a 3s battery and could never get it to fly. I even went the extent of borrowing an EDF from a friend and it still failed. I chalked it up to the fact that it was most likely under powered with a 3s battery or somehow weighed too much. However, I am not entirely sure what the problem was. 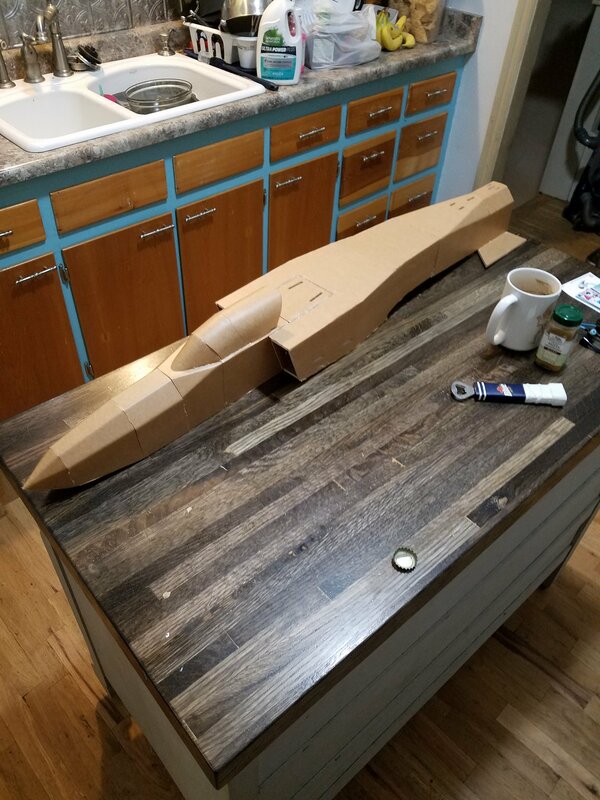 I was gifted the x29 this year and I don't want it to be a brick like the F22 I tried to make. I own some 3s batteries that I can try. I also purchased a 4s battery for the x29 because it was recommended by FT. Once again I appreciate your time. I just want this thing to be able to fly =/. I think these components should make it work. The 3s batteries I own are Hyperion 3S/11.1v 50c 1100 mAh weight of 91grams. Did you try the 2213 935kv on a 10x4 slow fly type prop? By my limited knowledge I would say 935kv is a little on the slow side for a shape like the F22 with limited wing surface. I looked at the X29 flight video and it looked a lot more manageable on an EDF, it seemed to be more prone to torque roll on the prop, I would think that will make it tricky to fly. I totally understand why you want a working model this time! Looking in more detail at what you have, the Turnigy 2836 will work on a 4s pack, it will give you the rpm you need to run with your 9x4.5 prop and you will need the 40A esc on that. That is pretty close to therecommended set up, you should be able to get the CG right with that 4s pack. What you can do is use the E calc set up finder to see what your flight characteristics are likely to be, using the information on the build page and the weight of your components. Hopefully someone clever will drop by and tell you for sure wether either of those set ups will work with it. I am still learning about flight stuff, despite a long background in other modelling, mechanical and RC bits and pieces. I did try slow fly props as well and it never generated enough thrust to stay flying. 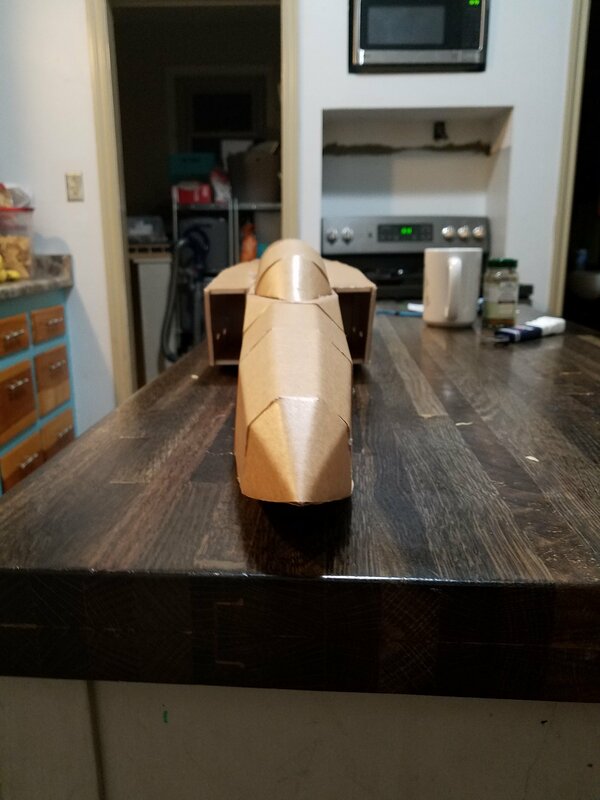 On the F22 I used some foam board from the craft store and I think the material was possibly too heavy to be used for an airplane? I tried a larger motor but I think my 20amp esc limited its potential as well. The heavier motor was underpowered and weighed more which made it still like tossing a brick. The 3s battery wasnt enough juice for the EDF as well. So this time I am hoping to do it all right lol. I strongly considered the EDF for the x29 but I live at a fairly high altitude (7000ft) and I was concerned it wouldnt initially have enough thrust from a hand launch. 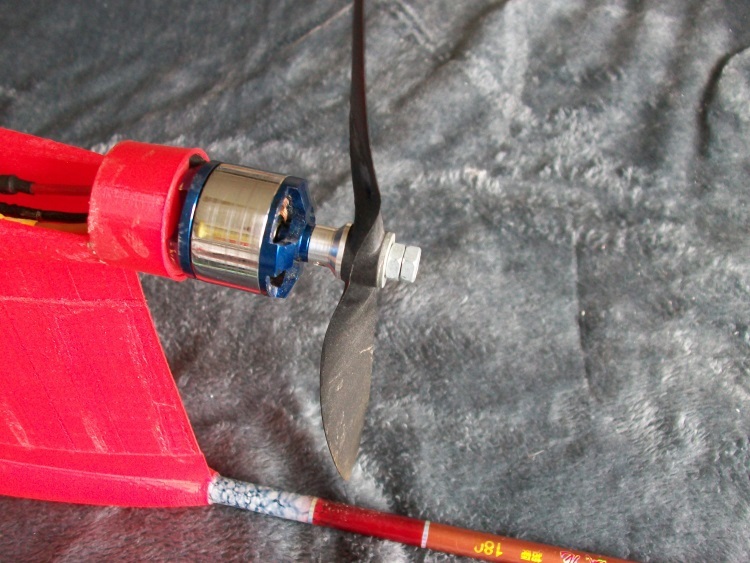 The torque roll is my biggest concern but I want to stick with a prop for more initial thrust and more flight time. I even thought about building a bungee launcher or potentially adding landing gear to help with the torque roll. I definately wont be able to launch it myself until I get a good feel for the plane. That turnigy 2836 motor you have will do about 1130 grams of thrust on 4s using a 7x3 prop. From what I'm seeing the x29 AUW is roughly 900 grams... Seems heavy but that's what the FT plans says. So that motor will do on 4s with a 7x3 prop about 200 more grams of thrust than the plane weighs. So, the math shows that it should fly it. I personally would go with the FliteTest c pack motor. A little more power. Or if you don't wanna spend $30 on a motor, banggood has the racerstar 2830 on sale for $8 right now. I have one of these on my FT Explorer and it has unlimited vertical. Stats show it putting out over 1300 grams of thrust on 4s with a 1045 prop and pulls about 29amps. So slap a 40a esc on it and your good. Here's the link. Anyway, when your looking at the motor, look in the description, they often put the thrust with prop and voltage they used to get that thrust. I'd say anything over 1000 grams of thrust should fly it decent. I do feel like 900grams for the x29 seems on the heavy side so you may wanna double check that. @kdobson83 Where are you finding the statistics for the turnigy motor? I plan on using a 9x4.5 prop and I am curious what thrust that would produce. Also, I am doubtful the plane will weigh 900g as well. I think it will be closer to 600g with all of the electronics. I'm flying a Turnigy D2826/10 1400Kv on my Bloody Baron. It's rated at 205W which puts it around the same power output as power pack B, but with higher Kv. So I was recommended a smaller, pitchier prop, 7x6E, which has enough thrust to send the Baron vertical at a good clip. Claimed static thrust is 1021g. Park 425 is supposed to be ~220W 1250kV so this motor should be pretty close as well. As brushless motors can be reversed so easily, whereas most IC engines cannot, there is no real need to use a dedicated "pusher" prop. The only issue is the nut on a standard prop driver will tend to undo so it either has to be done up really tight, secured with a nut lock compound or "locked" using two nuts. Over 350 Watts goes through the above with no problem. @nightm0de, Im just curious, are these planes your first ones? Do you already know how to fly? Not trying to sound rude, I am such a noobe and wreck more often not. I cant imagine trying to learn to fly on the planes/jets your talking about. Just something I thought of. @Jeffer949 I have built two simple scout's with the power pack B and have been flying consistently for 6 months or so. I feel comfortable flying, I am just not very familiar with motor sizes and prop sizes. I ended up purchasing the racerstar 2830 that @kdobson83 recommended. I waiting for it from banggood. Here is my build so far while I am waiting for parts.